"This refreshing soup, made with cooling ingredients and served icy cold, is the perfect light lunch on a hot day. I enjoy it all summer-and I always have the best naps after eating it. You can make the yogurt mixture ahead and keep it in the fridge and just dish out a bowl whenever you like. 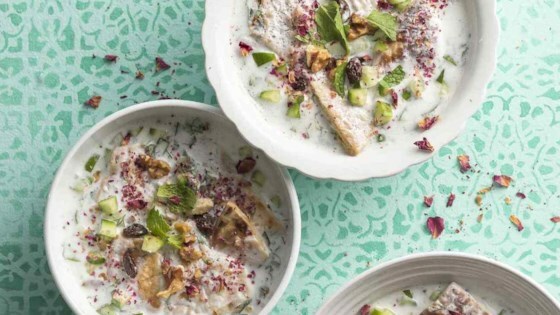 Though optional, the rose petals make it pretty and quintessentially Persian. You can usually find food-safe dried rose petals in Middle Eastern supermarkets." Puree yogurt, salt, and dried mint in a blender with enough of the water to create a smooth, thin soup. It will thicken some when you add the bread. Divide the cucumbers, raisins, walnuts, and herbs among four bowls. Pour one-fourth of the yogurt mixture into each bowl. Top with rose petals, and add a few ice cubes to each bowl. Tear bread into small pieces and add some to each bowl. Let bread soak 5 to 7 minutes before serving. Serve cold. Any seedless cucumber will do. Use 1 cup of any fresh green herbs you like, such as mint, parsley, dill, and basil. Substitute pita with any flatbread you prefer.